“Inner world-outer world” offered the audience a vista of an artistic canvas- traversing across tradition to the modern world of dance inculcating the need to keep the creative juices flowing. Introducing these diverse performances on the third day of the 29th Natya Kala Conference, Convenor Dr Ananda Shankar Jayant further brought to the fore a thinking panel of commentators and writers who discussed why media matters. Owing her complete understanding of expressive dance to her guru Kelucharan Mohapatra, Sujata Mohapatra tells the audience what it means for a dancer to imbibe experiences from real life and to translate them into spiritual arts. Demonstrating excerpts from her guru's choreographies, the danseuse showed the complete usage of body language for artistic expressions. From the devout Mohammedan poet seeking salvation, to a young village belle flirting with her lover Krishna… and the gaits of animals and birds used in the ballet Rutusamhara to the sculpturesque stances of a Swadhinabathruka naayika in the Astapadi- Sujata was quite entertaining. Lakshmi Vishwanathan continues her dalliance with her favourite dance compositions emphasising Madhura Bhakthi. Padavarnams and Padams: the heroine sings and dances in her many moods… the seasoned danseuse subtly and expressively painted pictures of these Nayeekas in love. Love in separation, in union, in anger…it was a soothing experience for the audience to see these languorously graceful Srungara Nayeekas coming to life! ,br> All said and done, media matters!!! The Natya Kala Conference also gave a platform for contemporary dance works that begin and expand beyond the classical idiom. 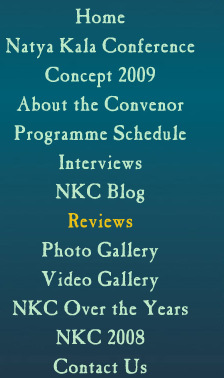 Most of these presentations are commissioned for corporate shows and general entertainment. These productions, too, do require a lot of thinking to amalgamate the past with the present and to make it entertaining and also meaningful. “Vajra,” as the Natya STEM Dance Kampni called their production, struck like lightening from and beyond the stage space! Well, this was a complete visual matrix that the dancers created as a collaboration of multi-dimensional and interactive videography juxtaposed with live dialogue and dance. All this and more, this ensemble digs into ancient texts to depict the esoteric through the modern tools of graphics and sound. All the while, a dynamic and fierce dance remained the backbone of the whole presentation. Yes, despite all the special effects, pure and abstract dance did take the centre stage! Choreographing commissioned work can also be fun! Tiruchelvam and his ensemble performed a few of his fusion compositions. Samudra dancers from Kerala wowed the audience with their intense creations that were deeply rooted in Indian mysticism and yet were modern in their stage presentation. Yogic and magical, aesthetic and lush, the central piece on Siva and Sakti was quite haunting. The earthy music of flute and indigenous percussion as the background score was equally compelling. Basic tones such as white, beige, and black were the colors generally worn on the third day of the conference by attendees. Presenter Sujata Mohapatra was exquisitely dressed on stage in a traditional red, black, and beige Oriya sari accented with fine silver jewelry. CV Chandrashekar's white kurta with exquisite images of the Ramayana, hand-painted by his student, made heads turn. Sruti magazine's S. Janaki was both daring and “eco-friendly” in her lime green and bright pink striped sari accessorized with pink paper jewelry. Equally offbeat was dashing Pradeesh Thiruthiya, who wore a black designer kurta and almost passed off as a model! Boasting an exquisite collection of vintage Kanchipuram silk saris, Leela Venkataraman has been consistently stylish throughout the conference. “I'm here at the Natya Kala Conference, enjoying it as usual. I'm finding it [to be] the most eclectic collection of performances here today I've ever seen together in one session–very interesting, very stimulating. I hope everybody including writers will be stimulated to write, not to critique, [the conference], but just to say what is interesting about it. These arts need to be read and conversed by people,” Katherine Kunhiraman, Senior Dancer & Teacher from Berkeley, U.S.A.
“I am very keen on attending this [conference] every year as it is a coming together and sharing of different dance dimensions,” Kavita Ramu, Dancer from Chennai. “It's such good exposure to attend this conference. Yes, dance gives you the utmost joy and it gives you the strength to fight all ailments,” Anita Guha, Dance Teacher from Chennai. “It is really a great pleasure to be part of the Natya Kala Conference. Thank you very much.” Samudhra Madhu, Dancer & Choreographer from Kerala.